News of Christ the Bridegroom Community reaches the Holy Father! 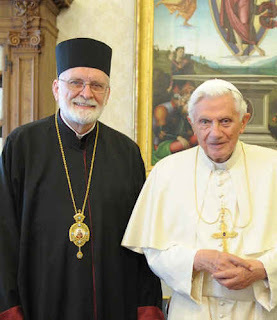 You can probably imagine that we were thrilled to find out that our bishop spoke to the Holy Father, Pope Benedict XVI, about our monastery during the Ad Limina visit of the Eastern Catholic bishops of the United States! Bishop John recently published his prepared remarks in his "Voice of the Shepherd" column in our eparchy's newspaper, Horizons, and we would like to share them here also. At the second meeting with Pope Benedict XVI, the Eastern Catholic bishops each presented a snapshot of their respective eparchies. The four leaders of the Byzantine Catholic Church in advance agreed to speak to different topics so to provide more information. Metropolitan William spoke to the history and the revitalization of the various aspects of the Church, Bishop Gerald to evangelization and missions, Father Edward Cimbala to youth ministry and vocations. I spoke to the topics of consecrated life and evangelization through culture. The following is the intervention I intended to present; since I did not want to read it, I strayed from the prepared text. Our Byzantine (Ruthenian) Catholic Church in the United States is committed to the New Evangelization and to instilling the culture of life into and through the various cultures of this country. In the Eparchy of Parma, we call this a Byzantine Catholic culture. Your Holiness spoke yesterday of the honored place in the Church of those in consecrated life. [Note: Metropolitan William reported of our Church’s monasteries in general terms.] In addition to our long-established monasteries, whose service to the Church is well-appreciated and to whose future the bishops and our membership are committed, we are open to new communities. My own eparchy has extended an invitation to those who would like to live a very eastern monastic style, according to the model set forth by Blessed John Paul in Orientale Lumen. Three women have responded to form the Community of Christ the Bridegroom, additionally inspired by Blessed John Paul’s teaching on celibacy in its relationship to sacramental marriage and also on the intimate relationship between God and man. We hope to follow this with other experiences for men and for women. Because of the eastern monastic style, we have found an opportunity to strengthen our relationship with Orthodox monasteries and hopefully in this way to strengthen the cause of ecumenism. We are in full-planning-mode here at the monastery for our upcoming girls' camp (one more week to register!) 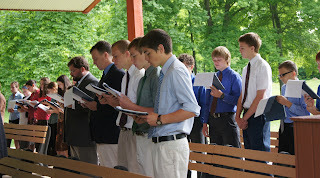 and teen campout (August 11-12, in conjunction with the annual pilgrimage at the Shrine...more info. coming soon!). 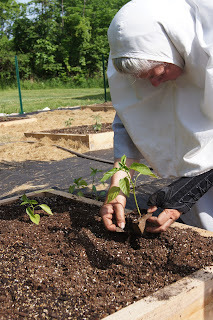 We are also immersing ourselves in our daily schedule of liturgical and private prayer, working in the garden and around the grounds, and continuing the provide hospitality to guests. The monastic life is very full! But God continues to refill us with energy and grace as we pour out everything He has given us. It is the power of the Holy Spirit, given at Pentecost, that fuels our life (and yours!). The talk we were scheduled to give this month at St. Nicholas Church in Barberton, Ohio, has been rescheduled for Thursday, August 2. However, our talk this Sunday, June 10, at Sacred Heart Church in Livonia, Mich., is still on! We will be speaking about our monastery and the purpose of monastic life. If you are anywhere near Livonia, please join us! Divine Liturgy begins at 10:00 a.m., and our talk will follow at 11:30 a.m. The students from the Lyceum school recently came out to celebrate the Divine Liturgy at the Shrine (which they sang in beautiful four-part harmony!) 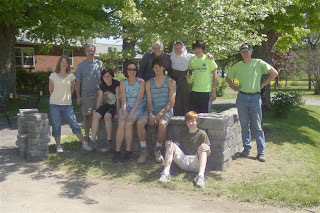 and to offer a day of service with outdoor work projects at the shrine and monastery. We were pleased to meet the students and grateful for all their hard work! 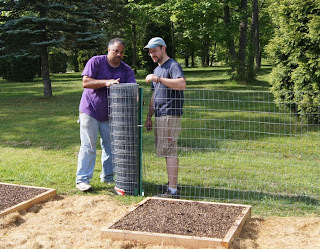 We never would have been able to build and install our new raised-bed vegetable gardens without the help of the volunteers who helped us at each step of the process. Thank you!!! 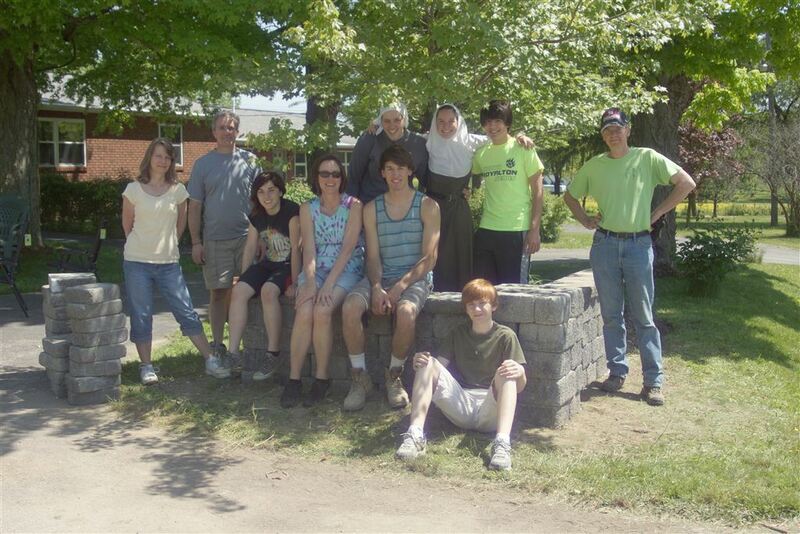 Sr. Julie's brother, Steven Hritz, a junior at North Royalton High School, chose our monastery as the recipient of his Eagle Scout Project! 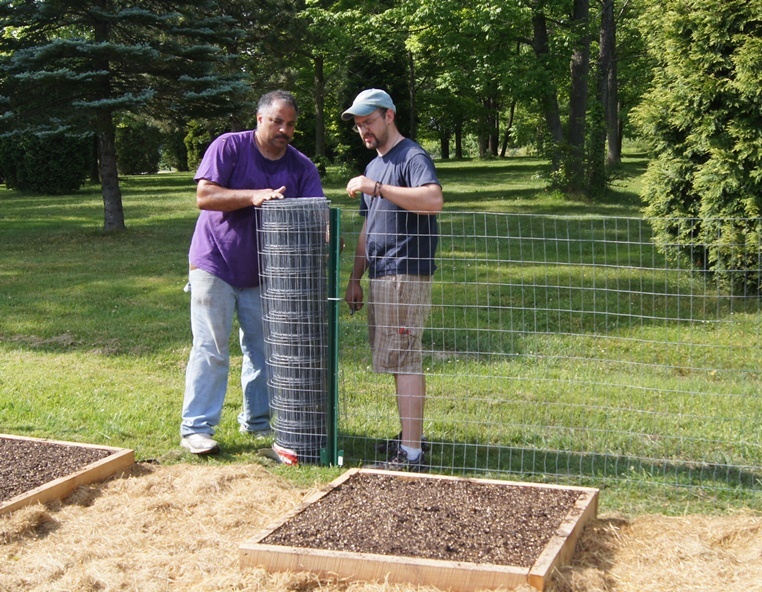 He brought out crews of friends and family on two Saturdays in May and completed a majority of the project. Two decorative stone walls have been built on each side of the driveway, with landscaping and beautiful flowers. The project will be finished with the installation of a sign for our monastery later in the summer! Now visitors will be able to find us much easier! We encourage you to participate in this fast in some small way, as a means of opening your life more fully to the power of the Holy Spirit! Please keep us in your prayers as we enter into a very full summer. 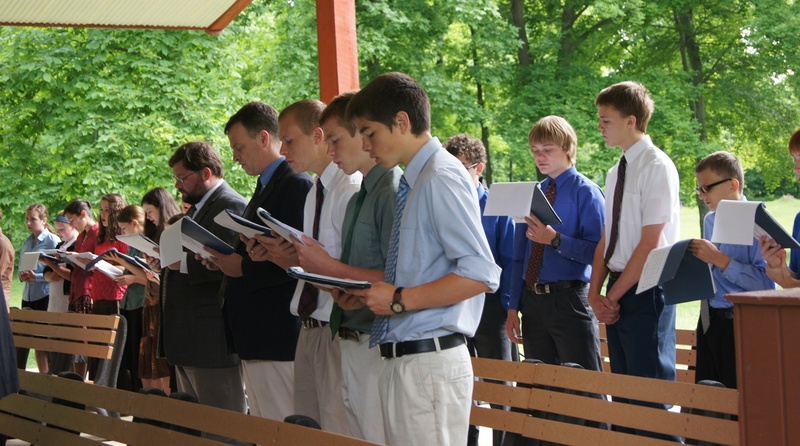 Please also pray for the teens who will attend the boy's and girls' camps this month and the campout/pilgrimage in August. Know that you are all in our prayers! 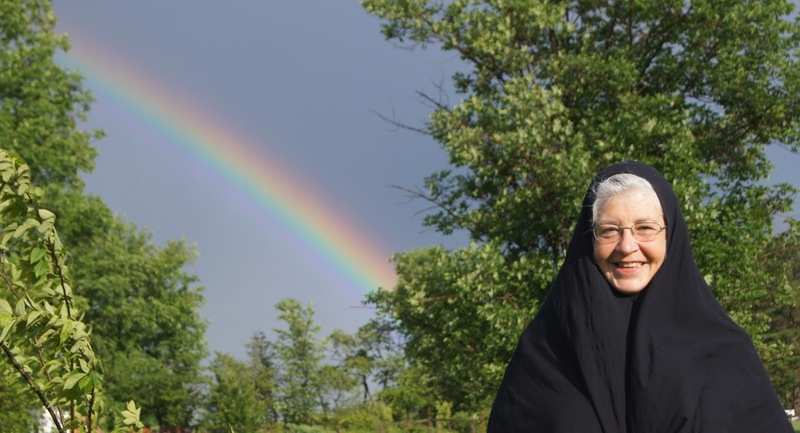 Mother Theodora loves rainbows! A bright one a few days ago.